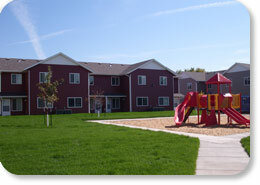 Sunshine Park Townhomes is a five building complex, with a total of 28 Townhome units (2 handicap accessible). The Townhome units consist of two, three, and four bedroom floor plans ranging from 1,052 square feet to 1,572 square feet. Each unit has private front and back entrances with an attached single stall garage, along with a range, refrigerator, microwave with hood, dishwasher, air conditioning, and washer and dryer hookups. Service animals are allowed if the proper documents are received by AHA.